why is the salary cap in the new Air NZ NPC Rugby comp a bad idea? I think the salary cap has been a disaster in the National Rugby League competition and I think it will yield similar results in our rugby National Provincial competition. The idea behind the salary cap is simple. Make sure no one rich club can buy all the best talent and therefore dominate the other clubs. By forcing the clubs to share the talent around, theoretically the competition will be more interesting and attract more punters. The other bonus being that clubs won't be bankrupted trying to buy high quality, expensive talent. The one problem is; it doesn't work. As Former rugby and rugby league international, Matthew Ridge wrote in the Sunday Star Times of July 2nd this year "the NRL is not some socialist utopia ; if a rich club wants a player it will get him, whether you put a salary restraint on it or not"
Therefore all salary caps actually achieve is increased corruption and dishonesty. How many salary caps scandals have we seen in the NRL? Didn't our own Warriors pay a huge fine and lose four competition points this year for that very offence? Our own NPC has every right to try to limit pressure on clubs by limiting salaries. However any attempt to bypass the law of supply and demand will always create undesirable side effects. In attempting to insulate their competition from the rigours of the market, the NPC bosses will do several things. b eventually lower the reputation of their sport. c make club management slacker and less responsive to the demands of players and punters. d give rugby league easier access to rugby talent as the potential salary difference between the two codes will be lessened. e gradually reduce the standard of rugby on offer so that punters become less enthusiastic about the game. Any attempt to introduce socialist ideas into high performance sport is doomed to failure. South African rugby is obviously handicapped by racial quotas. Similarly, the NPC will suffer in the long term if it persists with this dopey salary cap idea. I would have to disagree, I dont particularly like the salary cap, but from the view of my own enjoyment in following sport, I dont really like proffessional sport, that is not representative. Some competitions eg AFL, NRL, have communist systems(AFL is particularly bad), others have rediculous systems like the English premiership where the players are not from their local areas and only a few clubs can afford to do well. Personally I find it all rediculous. I sill like the warriors becuase they are the local team, and follow canterbury in the rugby and cricket because they are roughly representative, but It is still a bit rediculous and no method really will fix it. Representatives sport eg soccer world cup works pretty well but cricket is the only big team sport that NZers follow that International competition earns he most money. Obviously sporting organisations can run competitions how they like. I think i agree with trev, i mean why shouldnt the richest person be able to buy up everything? I mean what idiot would think that you would need checks and balances in a capitalist society? Thanks so much for this series of insights into libertarian philosophy trev, they have really reassured my faith in unffetted greed.
" I mean what idiot would think that you would need checks and balances in a capitalist society?" And what kind of idiot ignores whats been written about that here and how capitalism has its own checks and balances that keep that from happening? Another economic dunce that thinks wealth is a finite thing that only so many people can have...sigh! Walth in any real sense is intrinsically linked to the natural world, the natural world (as useful to us) happens to be finite. anon: you are a tard. the only thing that makes any hting valuable is that it is wanted. The prime reason for anything to become wanted or to fall in desirability is technology. Perhaps a draft system, where the bottom team in the division gets first dibs on non contracted players would be beneficial. what mechanism would be better for balance given that the home grounds for the super14 teams tend to manipulate the talent base for their areas into playing for the premier union?Ie how does Hawkes Bay counter wellington, canterbury or otago's tendancy to contract their players before they are elgilble to play premier division/ first class rugby? Thanks anon. I don't think "balance" is a desirable objective. 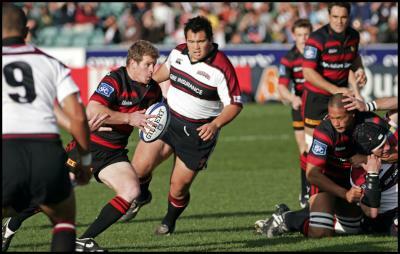 Canterbury tends to domite in NZ Rugby, just as Man U does in English soccer. What's better, a handicapping system that shares the talent around so that different teams win every year-as in the NRL, or a more free market system as in UK soccer or NZ Rugby, where certain teams tend to dominate for reasonably long periods? I think the free market approach is better in the long run as it not so open to corruption. Canterbury sets the standard in NZ rugby and iable to build up a long term culture where winning is expected. I think that this raises the bar for all teams far more effectively than the "everyone gets a turn approch. My view is that you shouldn't mix socialism and sport.